What is a Green Monster? A disgusting alcohol laden drink from your student days? Or a lovely nourishing juice? Add the OJ if you don’t have oranges. I am having my green juice as a post work snack because I plan on doing a quick yoga session soon and everybody knows that you cannot do yoga on a full stomach! I plan to have a gigantic salad with a heap of boiled potatoes for my dinner later. 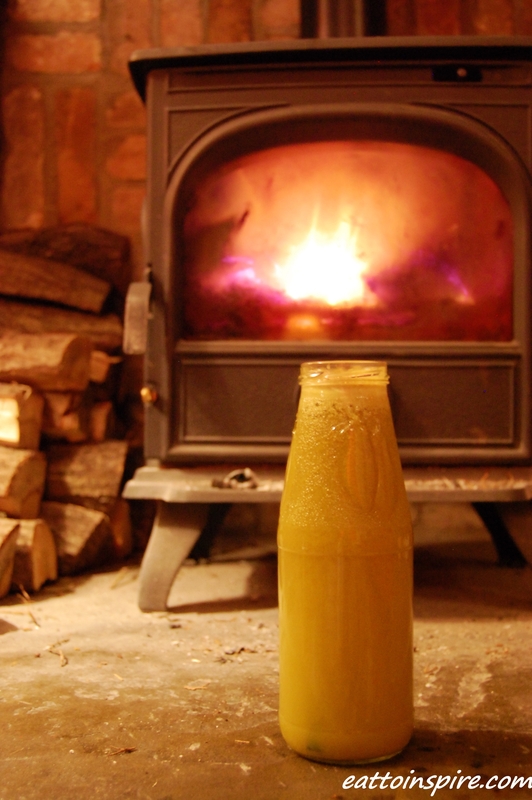 If anybody thinks it is too cold to have a juice or salad in England in the winter, it is not. How often do you eat your meals whilst shivering in the cold outside?! Light a fire and make your home feel cosy and warm. I am going to thoroughly enjoy my Green Monster and cosy fire right now 😀 I wish I could share it with you! Have an amazing Friday guys.